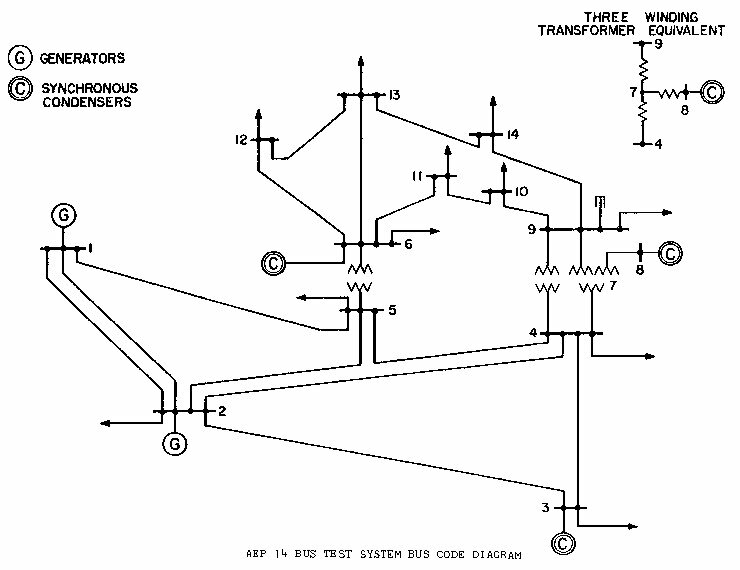 The IEEE 14 Bus Test Case represents a portion of the American Electric Power System (in the Midwestern US) as of February, 1962. A much-Xeroxed paper version of the data was kindly provided by Iraj Dabbagchi of AEP and entered in IEEE Common Data Format by Rich Christie at the University of Washington in August 1993. The data has not been run through a power flow to check the answers. If you find any corrections are needed, please let me know or provide comments below. The 14 bus test case does NOT have line limits. Compared to 1990's power systems, it has low base voltages and an overabundance of voltage control capability. Data in Common Data Format.